adventure from The Jim Henson Company. Giving a classic fable a contemporary makeover-- the film uses the personally invasive world of reality television where "disaster" and "humiliation" reign supreme as one character jokes for the backdrop for this retelling of one of the world's most famous home invaders in all of children's literature. The major change concerns our leading lady as Goldilocks is morphed into a "Paris Hilton-like television personality," as she's labeled in the DVD's making-of-featurette. In doing so, directors Howard E. Baker and Arish Fyzee pick up the thread of pro-family values woven into the rampant pop culture and offbeat situations in their two earlier Unstable Fables and draw creative inspiration from the early success of MTV's reality based series The Real World up through Big Brother, The Osbournes, The Simple Life, Extreme Makeover Home Edition and American Idol for Goldilocks and the 3 Bears. While hopped up on pixie sticks, Goldilocks disastrously takes it upon herself to remake the home of the Bear Family when they're away by turning it into a two-story candy coated version of a gingerbread house filled with suckers, peppermints, and so much potential for tooth decay that four out of five dentists may have to fast-forward through that scene just to take the sugar shock. 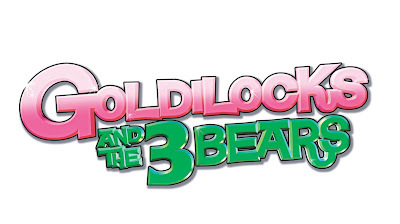 Now with their home in shambles and attracting every bee and insect in sight and her hit show "Totally Fab Rehab" canceled, the bubble-headed blonde's network decides to spice up the format by moving Goldilocks into the home of the three bears (voiced by Tom Arnold, Brooke Shields and Colton Parsons). 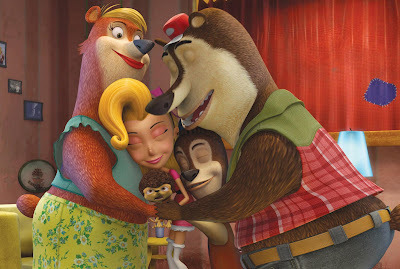 Filmed much like a reality series complete with camera confessionals-- the arrival of the spoiled diva into the house of the blue collar (or more appropriately brown furry) family turns the rest of the feature into a sitcom styled satire of fame, celebrity culture, and above all the importance of the family bond. In attempting to offer viewers a new look at an old story, elements of the original and other fables creep in as the old woman who lives in the show appears in one humorous scene and Junior Bear attends Grimm Middle School. And although it tries to incorporate some of the original dialogue and events, ultimately it was the goal of the Unstable Fables to revamp the works exclusively for young audiences. However, in-jokes abound and adults know exactly what's being referenced as Tom Arnold is witnessed delivering the famous raunchy punchline for the legendary "Aristocrats" joke, one quip about a homemade video where his son is in the garage playing with his light saber serves as both a double entendre and also a hilarious recurring gag on TV's Arrested Development, Arnold takes part in an Evel Knievel-like stunt to literally "jump the shark" while trying to make his fish stand compete with the neighboring Starbucks styled sushi chain, as well as a talent show finale complete with a "We Are Family" performance which riffs both Little Miss Sunshine and The Birdcage. 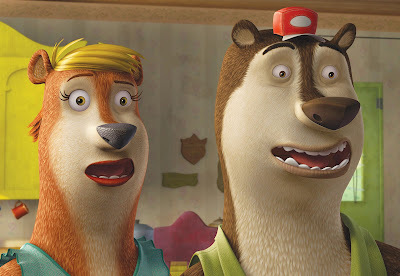 Although these Bears bear little in common with the original fable and it does seem a bit sitcom-like complete with opening the film right away with bodily humor, ultimately it's a clever roast of the reality TV phenomenon and manages to tap right into the same audience who enjoyed the television work of Spears, Shields, and Arnold (who we learn envisioned his character to be sort of like Jackie Gleason's on The Honeymooners) as well as filmmaker Howard E. Baker's directorial efforts on Nickelodeon's Rugrats. Inventive, bright and colorfully animated-- while it's not on par with classic Henson-- as my first foray into the Unstable Fables, I'm particularly interested in checking out the others brought to DVD by The Weinstein Company and Genius Products which were released over the past few months. Featuring an interesting making-of-featurette that is sure to appeal more to animation fans and adults than the children for whom the movie is targeted, there's a great nine minute extra included right with the kids in mind as Baker teaches children how to draw a character and introduces them to the world of storyboard animation. With a distinct visual style and characters drawn as Baker reveals to look as though they are human beings in an animal costume, the dynamite CGI is a standout and looks especially impressive on high definition televisions where the 3-D quality really manages to pop off the screen (similar to the recent straight-to-DVD Genius/Weinstein award-winning animated version of The Nutty Professor). Thus in the end-- this fable isn't really unstable at all and manages to put major studio based works Space Chimps and Fly Me to the Moon to shame.